Rumor: SONY PS4 and Diablo III on the Cloud? 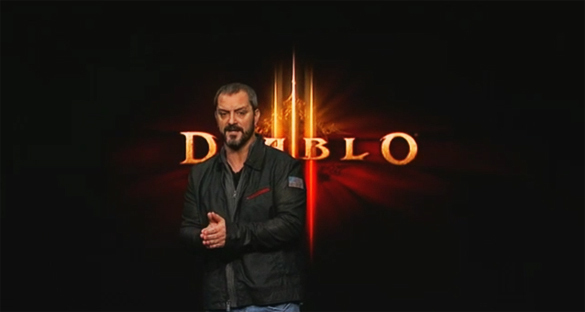 It took everyone no doubt by surprise to see Blizzard VP of Creative & Franchise Development Chris Metzen walk onstage during the SONY PlayStation 4 Announcement Conference. Especially announcing that Diablo III would be playable on the PS3 and the PS4. That SONY and Blizzard Entertainment had gotten into a strategic partnership. I have read hundreds of responses from fans in our Facebook/Twitter, and at other Gaming websites comment sections, and forums. Among concerns I have seen with some fans is that this is a PS3/PS4 only announcement. Where is the XBOX 360 version of Diablo III? This is not a PS4-exclusive port. During the GameTrailers interview, it was clear that Blizzard Entertainment announced the PS3/PS4 port because this was the correct timing with SONY announcing the PS4. It’s just a matter of time for MICROSOFT to announce their upcoming XBOX 720 (or whatever name they decide to call it). It’s heard in the internet that Microsoft plans to unveil their next console some time around April 2013 in response to SONY’s announcement. Blizzard was simply polite not to mention their Diablo III plans for the XBox in the middle of a SONY event. Some fans are like, ok, Blizzard announced Diablo III for PlayStation. Who cares? That game [insert random trollish insult]. I think people don’t realize how big this news is for Blizzard gamers who also have access to a console, or to gamers who plan to buy one of the newest consoles, or to gamers who have no PC, but have a console. It’s not just Diablo III, guys and gals — and LGBT. Blizzard has the Next-Gen MMO, Blizzard All-Stars and a yet unannounced MMO in development. Diablo III was just the ice-breaker to enter the console terrain after a long hiatus. There is no doubt in my mind that Blizzard might bring those heavy-hitters to the PC and Console platforms. The thing is that the old days of gaming have changed. Drastically. The future of gaming is now. Innovative technology. SONY talked about Gaikai cloud. Basically, the back compatible aspect of playing PS1, PS2, and PS3 games is handled through the cloud. There are two aspects of the PlayStation 4 that SONY hasn’t talked about. The most important that some people might not know about or might have forgotten is the acquisition of Gaikai by SONY in July 2012. I know about it because I have kept watch on Gaikai since May 2010 when David Perry teased he was playing World of Warcraft on the original iPad through the innovative Cloud gaming technology developed by his company. I follow David Perry on Facebook ever since. I remember on August 2012, when Gaikai announced their company was acquired by SONY. I was bummed and ranty because I wanted them to stay on the PC, because I knew there was a lot of potential to revolutionize gaming without the need of downloading 2GB-16GB of data for full games or big patches. No need of spending $400-600 in the cream-of-the-cream top-notch graphic cards. So, alright. SONY acquired Gaikai. What can they bring to the table? Did you notice how there was basically no PS4 core hardware to show at the PS4 announcement? It wouldn’t be “Blizzplanet” if there is no over-hyped speculation. I say, SONY is slowly preparing to announce the big news at a later time. It’s a strategic gradual filtration of info throughout the year until the PS4’s Holiday 2013 release. There is something innovative about the PlayStation 4 that’s gonna kick MICROSOFT in the two “O”s. That is the Gaikai’s Cloud streaming and server technology — the Cloud Gaming Platform. “Shhh …” the thing is it has not been announced yet by SONY — especially not at the big PS4 Announcement event. So how is cloud gaming going to affect Diablo III if in any way? I personally don’t know the answer to that, but I’ll assume if Blizzard gets access to the (non-announced and figuratively-speaking) PS4 cloud network infrastructure, there wouldn’t be a need to send patches directly to the PS4. Certain gaming functions would be over the cloud. Imagine playing Diablo III or future Blizzard games on your PS4 in the morning. You need to take a flight to another state or country for business reasons. Lot of downtime on your Amtrak train or Airplane. You turn on your SONY Vita. Hook up the DualShock4 Controller into the SONY Vita port or simply use the wireless Bluetooth, and continue playing Diablo III via live streaming (thanks to SONY’s Gaikai servers platform). I have three powerful questions. Did SONY really disclose all their plan with Gaikai’s cloud? Will SONY only use the Gaikai cloud technology as a PS4/Vita exclusive or branch out their cloud server service into Android/Apple tablets? Does Blizzard Entertainment have access to the Gaikai cloud technology with this new SONY partnership? It’s all in the cloud — I mean, up in the air. All speculation. Or is it? Imagine you have a PS4. You pay to watch BlizzCon 2014 livestream on the PS4, and you get to play the Next-Gen MMO “Titan” demo stationed at BlizzCon 2014-2015 on the PS4 on the Cloud!!! You play the Titan demo right there, right now without downloading any files, without the need of installing any drivers or plugins. You are launching the demo and playing straight. That. Is. Awesome. Imagine PlayStation 4 is not just the hardware, but the PlayStation Network Cloud. You can play games and demos on the PS4. The PS3. The Vita. On your PC internet browser, on Facebook, and on your tablet. That’s thinking outside the box. “Can Gaikai’s cloud gaming platform stream full games? To “any internet-connected device” instead of “PS4 and PS Vita”. That right there implies tablets and smartphones in general. Is the SONY paving the way to expand the PSN beyond the PS4 box? Just think about it … how is SONY planning to pay for cloud streaming bandwidth? Unless there is some sort of PSN subscription fee for non-PS4/Vita owners, micro-transaction, or other revenue sourcing plans to sustain bandwidth costs yet to be announced. Closing my speculation, I want to share with our fans some of the “partial” specs of the PlayStation 4 available on the SONY website. Note: These specs are on our usual bluepost quotes, but are not “Blizzard Entertainment” quotes. “Wait a minute, I don’t remember SONY acquiring Gaikai” or “Who in the world is Gaikai?” — I got you covered, bro. Here is the July 2012 press release. What in the world is gaming cloud technology? Visit the Gaikai FAQ website. Jump to minute 5:40 for Chris Arnone discussing Cloud gaming and SONY buying Gaikai.